Yesterday I went to a potluck birthday and brought this very yummy dessert: Greek yogurt and lemon curd tart! It is relatively healthy, as the crust is made my a fine layer of Graham crackers (you can use whole grain if you feel extra healthy) and the filling is mainly Greek yogurt (very high in protein) a tad of honey and lemon curd. I used fresh berries to decorate. I found the recipe in Pinterest, from thekitchn.com, and first tried it with triple ginger snap crust, which I like very much as well. This time I tried with the Graham cracker crust and it worked wonderfully too. Enjoy! A super simple Greek Yogurt with Graham cookie crust. Delicious and healthy too! 2 c. Greek yogurt. I use Chobani. Place the Graham crackers in a food processor or in a ziploc bag and make into fine crumbs. If using a food processor, add the melted butter and process until all the crumbs are nice and moist with the butter. If you use the bag, place the crumbs in a bowl and mix with the melted butter to moist evenly. Heat the oven a 375 Fahrenheit. In a 9 inch pie pan, press the crumb mixture distributing evenly with your fingers on the bottom of a tart or pie pan and up the sides. Bake for 8-10 minutes. Let it cool for at least 40 minutes before you pour in the filling. In a large bowl put the 2 cups of Greek yogurt and the lemon curd. Whisk until you have a perfect mix. Add a tablespoon of honey, or more if you like your filling a little sweeter. Add the teaspoon of vanilla and whisk some more. In a little bowl put the 2 tablespoons of water and sprinkle the gelatin on top, until it is all moist. Let it sit for a couple of minutes, until all the powdered gelatin is moistened. Place in the microwave for 10 seconds, then stir very well to dissolve the gelatin and stir into the yogurt mix, whisking well to incorporate everything. Pour the filling into the prepared cooled tart pan, and place in the refrigerator, for at least one hour. You can even leave it overnight, covered. 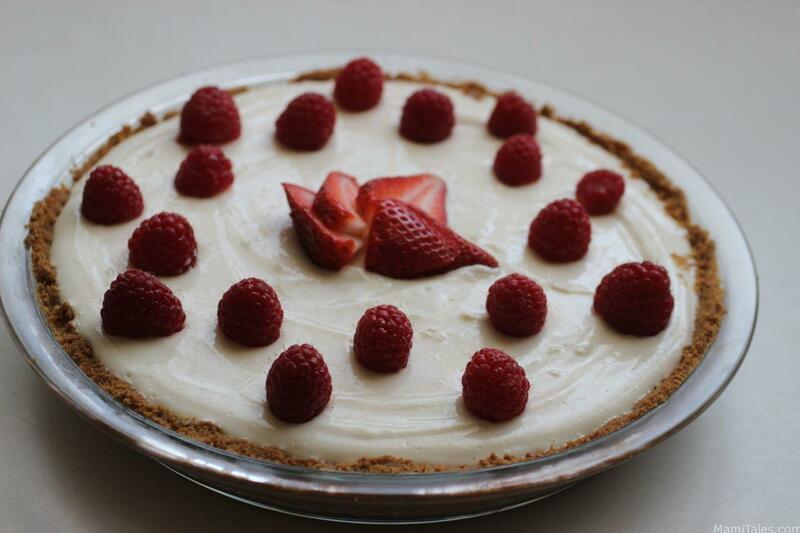 Once you’re ready to serve the tart, take it out of the refrigerator and decorate with berries or your favorite fruit. Enjoy!! I've done this with both non-fat Greek Yogurt and Regular Greek Yogurt. They both work great. I like using Fage or Chobani, as they have a higher protein content and a very good consistency. Fage is a lot thicker. You can also use Triple Ginger snaps for the crust, and it works great too! Im scared to make this because I may eat the whole thing! Kit looks like the perfect dessert for summer. Mmmm I love the look of this – As luck would have it, I have some Greek yogurt I need to use up in the fridge. You are very welcome to add this to #Bakeoftheweek too. That’s wonderful! I’m very glad the recipe helped! And I’m going over to your site and add it too. Thanks!